Music A to Z: A is for…. I know that Easter was yesterday, but I’m still in a hopping mood. Are you all ready for the very first MusicAtoZ blog hop? Good! This week’s letter is A.
I heard this song twice this week, once at the grocery store and once by a group of young a capella singers from The University of Vermont who call themselves “The Topcats”. When I heard it the first time, I thought to myself, “Oh, I’ve always loved this song. Maybe I can use it for the “A” theme this week”. When I heard it the second time, in a non-Muzak venue, I know it was kismet. In other words, I just had to use it. Since I was strolling down memory lane, I began to think about other “A” bands and artists that I haven’t heard in years. Through both the movie and the stage show “Mamma Mia”, Abba’s music has enjoyed a resurgence in recent years. I’ve not seen either incarnation of the musical. Still, I loved Abba back in the day. This one was my favorite. No “A” list would be complete without the inclusion of Aerosmith. Anyone only familiar with Aerosmith as a result of Steven Tyler’s appearance on “American Idol”, should note that these guys have been around for a long, long, long time. There’s a reason for that — they’re great. Steven Tyler could sing the phone book and I’d listen, but when he’s singing with Joe Perry and the boys he’s at the top of his already world-class game. This one is a little bit on the softer side, but I’ve always loved it. When speaking of bands who’ve been around for a long, long, long time, in one incarnation or another, one can’t help but think of The Allman Brothers Band. They played their first gigs together back in the ’60s and they’re still making music today. This is a great song, showcasing as it does their southern roots and highlighting the fabulous guitar solos for which they are famous. Greg Allman’s vocals aren’t too shabby, either. I’ve been a big Bryan Adams fan since “Summer of ’69”. I love his voice. Sure, he can rock and roll, but I prefer his more tender side. This is a great song, even given the fact that it was the theme song to “Robin Hood: Prince of Thieves” and just about every couple’s wedding song post-1990. Still, it’s a keeper. Link up below. Read, share, and comment on as many posts as you can! Thanks for playing along. Next week (4/28) our letter will be “B”! 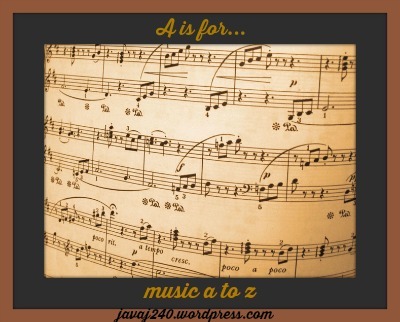 This entry was posted in Ambling & Rambling, Music and tagged blog hop, javajmusicatoz, letter A. And I’ve always loved that Aerosmith song. So I joined in – hope you like it – and I wish you success with the new hop! I love Robin Hood, too. “Prince of Thieves” would have been fine if I hadn’t been so distracted by Costner’s “now I have it, now I don’t” accent, LOL! LOL! I forgot all about Keanu. I love the Allman Brothers! I think Fernando is definitely in my top 50 best songs ever! Great list! Agreed! Thanks so much for reading and for allowing me to promote this on your FB page! You’re the best!